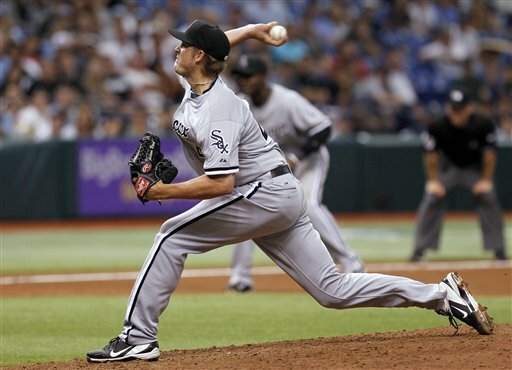 White Sox closer Addison Reed averages 97 to 98 mph. Sox catcher AJ Pierzynski talks to Addison Reed on the mound. You might call Addison Reed and Nate Jones the “young guns” of the White Sox. The two rookie pitchers are making an impact with the bullpen and have erased some of the biggest questions at the start of the season. Reed and Jones can both bring it to the plate with dazzling speed averaging 97 to 98 mph. Both were Sox draft picks, but with different timetables to the major leagues. 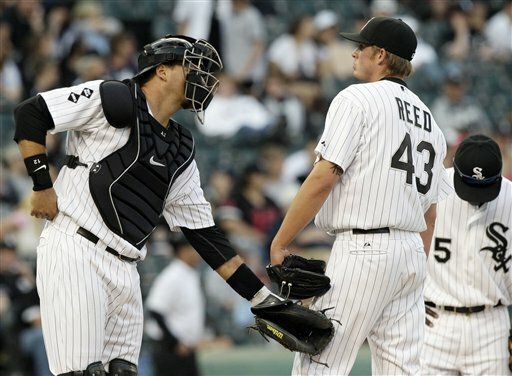 This season Robin Ventura used Matt Thorton and Hector Santiago as closers; after their struggles the job went to Reed. The 6’4”, 220 lb. right hander was drafted just two years ago from San Diego State, and Reed’s rise with the White Sox has been as blazing as his pitches. He flew through the minors last year: low A, A ball, AA, then AAA, and was brought up to the major leagues in September. Reed said his rise was “a dream come true.” He has a closer’s mentality to go with his ability. “I try not to think about too much stuff,” Reed said. “I forget about what happened the day before- good or bad.” Just a few weeks ago, Ventura officially gave the toughest bullpen job to the young rookie. It has been a major coupe for the Sox manager and the team. The 23-year-old California native’s draft day was pretty special, too. When the Sox took him in the third round, his younger brother Austin was also taken in round 13. . . by the Cubs. Right now, the younger Reed is in Peoria with the Cubs A-level minor league team. Addison figures if his brother ever makes it to the majors with the Cubs and they meet in a Cubs-Sox series, his parents will have to get half-Cub half-Sox jerseys. Meanwhile, the 26-year-old Jones was a fifth round draft pick for the White Sox in 2007. He didn’t even know he would be drafted. “I come from a small town and got a baseball scholarship,” Jones said. “That was a big deal for us.” Small town indeed: Butler, Kentucky has a population of 612. In the Sox organization, Jones has moved up one step every year, one minor league level at a time. The big right hander attributes his ascent to his parallel rise in confidence – something he lacked at first but which now shines through. He stands 6’5” tall and weighs 185 lbs. and his fastball ranges from 97 to 100 mph. Even last Saturday, sick with a flu bug, the radar gun clocked him reaching that range. Both Jones and Reed are still feeling their way around life in Chicago. He was used to traveling miles to reach a Wal-Mart; now Jones said he and his wife love walking just a few blocks to buy anything they need. Reed loves the good food but he likes to take it easy and relax when he is home. That is a rather mature attitude for a professional baseball player to take, especially at his age. They sure have been. These two rookies are making big contributions with their powerful arms.